Mix flour, yeast and salt. Add 2 ½ C waster, honey, olive oil and garlic, mix to form a soft dough. Add a little additional water if the dough is too dry or a little additional flour if too sticky. Knead until the dough is soft and elastic, about 10 minutes. Put the doug into a bowl filmed with olive oil: turn to coat. Cover with plastic wrap. Let dough rise in a warm place until doubled in bulk, about 1 hour. Punch down dough; divide into 12 (6 oz) or 24 (3 oz) pieces as desired. Shape pieces into egg-shaped rolls. Cover with plastic wrap; let rest 15 minutes. Flatten and shape each piece of dough into a long oval, about 3/8 inch thick. Arrange on a parchment –lined sheet pan that has been sprinkled with polenta. Sprinkle large pieces with a 1 ½ T roasted pepper and ¼ teaspoon rosemary. ( Use half these amounts for 3 oz pieces)_ lightlyly cover with plastic wrap. Let rise in a warm place until doubled in bulk, about 45 minutes. Bake at 325F until lightly browned, about 20 minutes for the 6 oz size and about 12 mintue sfor the 3 oz size. Remove from oven. 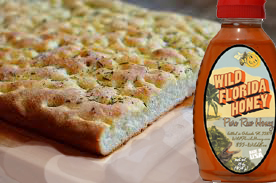 Carefully brush each foccacia with warmed honey and lightly sprinkle with salt. Makes 24 small (3 oz each ) or 12 large ( 6oz each ) servings.